What began as a small, autobiographical play about her rigorously traditional Greek family accepting her non-Greek boyfriend into the fold has now become the highest grossing independent film of all time. Initially driven by good ol’ word-of-mouth, Nia Vardalos’ little film that could has since been absorbed by the Hollywood hype and merchandising machine. But does My Big Fat Greek Wedding (2002) live up to all the hype? 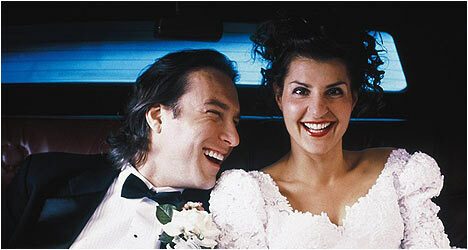 Toula (Vardalos) is a frumpy, 30-year old bachelorette who works as a hostess at her father’s restaurant. She has been raised to follow the Greek tradition, as she puts it, “marry Greek boys, make Greek babies and feed everyone until the day we die.” Her family house is even modeled after the Parthenon, complete with Corinthian columns and statues of the Greek gods. One day, Toula meets Ian (Corbett), a tall, handsome man who is definitely not Greek. Initially, nothing happens between the two but over time their paths cross again and they fall in love. They decide to get married, which doesn’t go over too well with Toula’s family. My Big Fat Greek Wedding contains echoes of other family comedies, like The In-Laws (1979) and Moonstruck (1987). A lot of the humour comes from the cultural clash between Ian’s bland, whitebread family and Toula’s loud, colourful clan. Like Moonstruck did for Italian culture, Greek Wedding immerses the viewer completely in Greek customs. Vardalos’ script gently parodies while also celebrating her Greek heritage in a way that is very funny. While Greek Wedding does follow a fairly predictable formula it deviates in a few meaningful ways. Toula improves herself and her appearance not for a man but for herself and to change her lot in life. Also, Ian doesn’t miraculously fall in love with her after she physically transforms herself. He was already attracted to Toula in her frumpy state. Greek Wedding works because of Vardalos’ witty screenplay with its spot-on observations of her family and their oddball habits (her father believes that any ailment can be cured by a quick spray of Windex). The film also features two engaging leads that the audience can identify with and who have fantastic onscreen chemistry. Vardalos’ Toula is the neurotic comic relief who is constantly embarrassed by her family, while Corbett’s Ian is the straight man, a genuinely nice guy who is loyal and understanding. However, it is the cast of actors that portray Toula’s family that steals every scene. Michael Constantine is perfectly cast as the uber-strict dad who is really a softy underneath it all. Andrea Martin showcases the many years she played funny character parts in SCTV with her flamboyant and constantly nagging aunt. The real surprise, however, is Louis Mandylor as Toula’s hunky, dim-witted brother. At first, he comes across as predictable stereotype but part way through the film he has a scene with Vardalos that provides additional insight into his character. For such a high-profile and much celebrated movie, this DVD comes with very few extras. The studio may have rushed the production of the disc to cash in on the huge buzz this film is experiencing and in the process have short-changed its audience. There is the standard cast biographies which are nicely done but nothing special. The real (and only) highlight is the engaging audio commentary by Nia Vardalos, John Corbett and the film’s director, Joel Zwick. Corbett and Zwick chime in on the odd occasion but clearly this is Vardalos’ show. She dominates the commentary track as she talks about how much the characters and situations in the movie are based on her own family. She also provides amusing anecdotes about making the movie, including Andrea Martin’s uncanny knack for improvisation and her make out scenes with Corbett. Sadly, these are the only extras. Where are the featurettes? Perhaps the screenplay to Vardalos’ original play? Interviews with the film’s famous producers, Tom Hanks and Rita Wilson? Some insight into why they chose to get behind this project in the first place would have proved most insightful. These are all opportunities that are sorely missed. While hardly the greatest comedy of all time, as recent TV advertisements playfully suggest, My Big Fat Greek Wedding is a truly classy comedy that refuses to use gross-out humour or create hopelessly unrealistic comic situations that dominate most contemporary comedies. It is easy to see why this movie became such a monster hit – it does a fantastic job of pushing all the right feel-good buttons. The movie has no other pretensions other than to entertain and on that level it more than succeeds.